Tony Marquez, 29, lives at the Atlantic Terminal Houses with his 9-year-old son. While he doesn't smoke in the apartment or around his son, he said the smoking ban that was recently passed for public housing complexes would likely lead him to quit. FORT GREENE — The details of a recently announced ban on smoking in public housing have caught some residents by surprise — with tenants worried they will be booted from their longtime apartments for something other New Yorkers are free to do in their own homes. In November, the Department of Housing and Urban Development passed a new rule mandating that the New York City Housing Authority (NYCHA) and approximately 3,100 other public housing agencies implement smoke-free policies over the next 18 months. Under the new rule, NYCHA residents won’t be allowed to light cigarettes, cigars or pipes inside their apartments, indoor common areas, administrative offices or within 25 feet of public housing buildings. What many residents don’t know is that defying the smoking ban could eventually lead to eviction. The new rule can be added to tenants’ leases either through an amendment process or as tenants renew their leases annually, the ruling states. Now, residents who have been smoking for years are worried they might be evicted from their longtime apartments for a habit that has proven difficult to break. Flemister, who has been smoking for 10 years, said he and his wife have been trying to quit since they found out their 4-year-old son Eli has asthma. One of the primary reasons the Obama administration passed the smoking ban is to curb childhood asthma. Flemister, who noted that he doesn't smoke around his children, said quitting is a lot easier said than done. Tenants are also worried about how the smoking ban would be enforced, questioning how authorities will monitor what happens inside their own homes. “So what, they’re going to come inside or they’re going to place cameras inside to see what you’re doing?” asked Cora, 62, a longtime Ingersoll Houses tenant who declined to give her last name. While NYCHA has not yet said how the smoking ban will be specifically enforced at its properties — both inside apartments and outdoors — the HUD ruling suggests a “graduated enforcement approach” to deal with violators, including escalated warnings with documentation. Smoking violations will be distinguished from criminal offenses to discourage overly aggressive enforcement and decrease the potential of eviction, the ruling adds. Tenants facing lease termination will also retain the right to an informal and formal hearing before their tenancy is terminated, the HUD ruling states. "We are currently reviewing HUD’s rule and will work with our residents to implement a smoke-free policy aimed at reducing exposure to second hand smoke and improving the quality of life of our residents," said a NYCHA spokeswoman. The spokeswoman could not outline the agency's current policy for non-criminal lease violations. Residents like Cora, who has lived in the Ingersoll Houses for more than 40 years, said it’s unfair to those who live in public housing that the government can control what they do in the privacy of their own homes. Smokers-rights group Citizens Lobbying Against Smoker Harassment (C.L.A.S.H.) said it is sending an appeal to President-elect Donald Trump to remove the rule when he takes office, citing residents' right to privacy as its main concern. "[The rule's] institution represents a degradation of fundamental American ideals on several levels, including states’ rights," C.L.A.S.H. founder Audrey Silk said in a statement. "At stake is the right of U.S. citizens to be left alone to engage in a legal activity in the privacy of one’s own home." John Johnson, chair of NYCHA’s Citywide Council of Presidents, said the new ruling is just another caveat of living in publicly owned housing. “At the end of the day I tell the residents that you don’t own the apartment, you rent the apartment, therefore you don’t have as many rights as you think you,” said Johnson, a resident of the Mott Haven Houses in the South Bronx. How the rule will be enforced outside NYCHA buildings remains a question to those who will be required to step outside to light up. Cora, who has been smoking on and off since she was 33, said she only smokes on the steps in front of her Ingersoll Houses apartment and doesn’t allow smoking inside the house or near her grandchildren. She noted that she would probably have to walk up the block by the Bravo supermarket on Myrtle Avenue and Washington Park to smoke, an inconvenience compared to her usual routine. Some residents are taking the forthcoming ban as motivation. 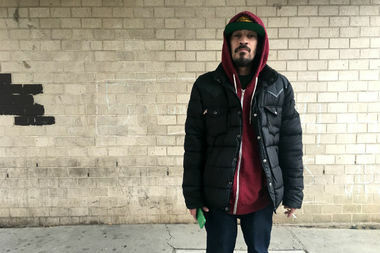 "I wish I never picked none of these up, I’ll tell you now," said 29-year-old Tony Marquez, who lives at the Atlantic Terminal Houses in Fort Greene with his 9-year-old son. "Probably I’ll quit these in a year or two, because of the ban, maybe they’re going to help me out. That’s how I look at it, maybe I’ll stop smoking." But other tenants flat-out dismissed the new guidelines.